Let me start of by saying you HAVE to try this chicken! 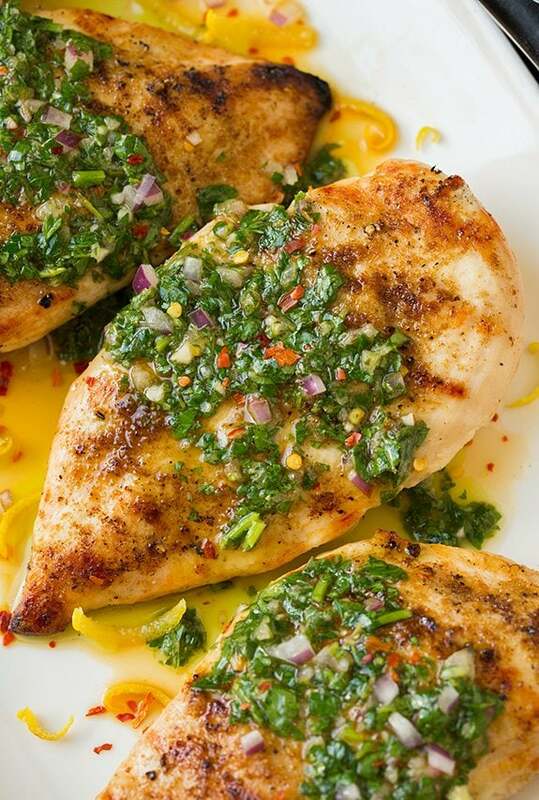 This Cumin Rubbed Grilled Chicken with Chimichurri Sauce is the definition of good food! It is packed to the max with vibrant flavors, it’s hearty, it’s healthy, its colorful, it’s fresh. How could you go wrong? I could live on this for weeks! 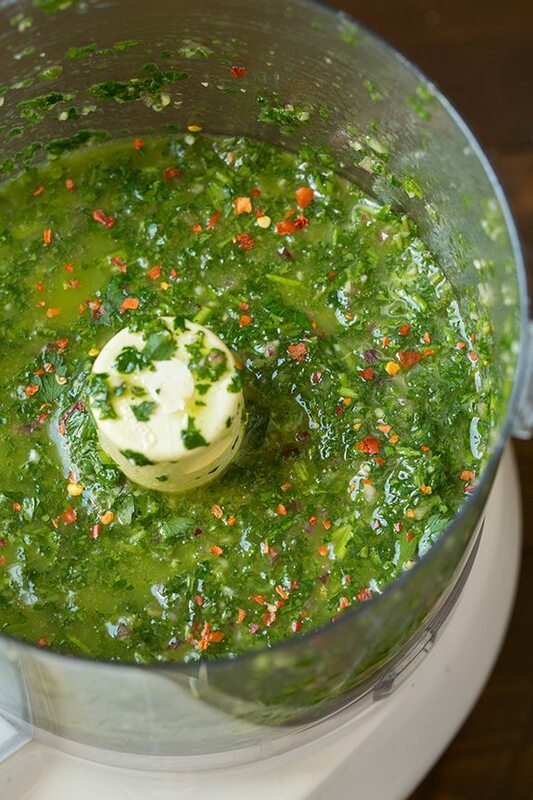 I first learned about chimichurri sauce from my husband because he had lived in Argentina for two years, so in other words I’d been living most of my life missing out on such an amazing thing. This recipe I made isn’t your typical Argentine chimchurri (as far as I know). 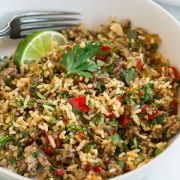 I don’t know that you’d find cilantro in a typical version there – but I love LOVE cilantro so I can’t resist adding some to mine. Red pepper flakes also aren’t typical but I like a little heat and the red onion is another no so common ingredient but I really like the flavor it brings so I add a bit to it here. Then you’ll usually find either vinegar or lemon juice but I like the combination of the two so I go with both. More often then not you’ll see chimchurri sauce served with some sort of beef or sausage, which I love it with as well, but I love it just as much served over chicken, so tada. Here you are. 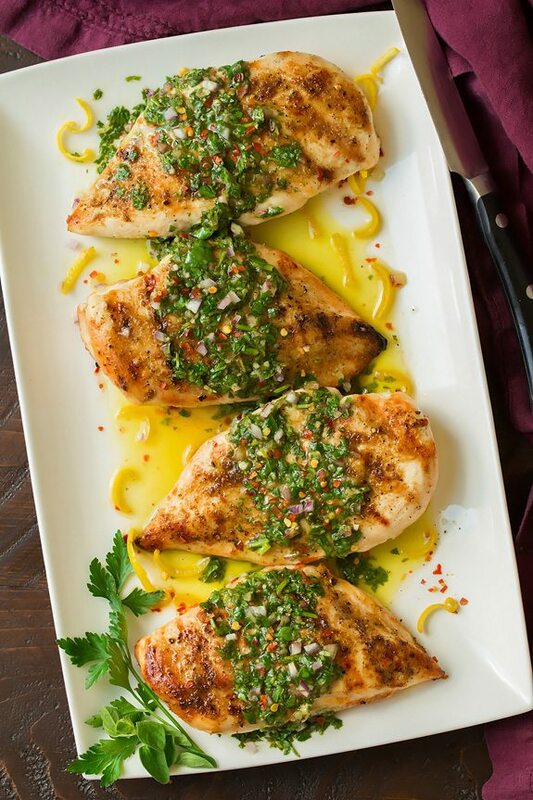 A delicious spiced rubbed chicken, grilled to perfection and topped with a generous spoonful of chimichurri. Then if you’re like me you’ll add chimichurri to everthing else on your plate :). I love it with grilled vegetables or baked potatoes. Maybe that’s weird, but try it and you may just find yourself loving it too. You’ll have left over sauce so you may as well add it to the side dish too. 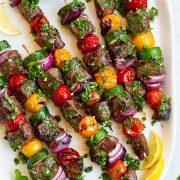 If you haven’t tried chimichurri sauce don’t let another week go by without making it, trust me you need it in your life! I can’t wait for the herbs in my garden to be fully grown so I can make this for days an days…and days! Have I said I love this stuff yet? I really, really love it! 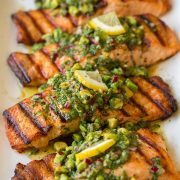 Lean chicken breasts are rubbed with earthy cumin spice the grilled and topped with a bright, fresh chimichurri sauce. A staple summer recipe! 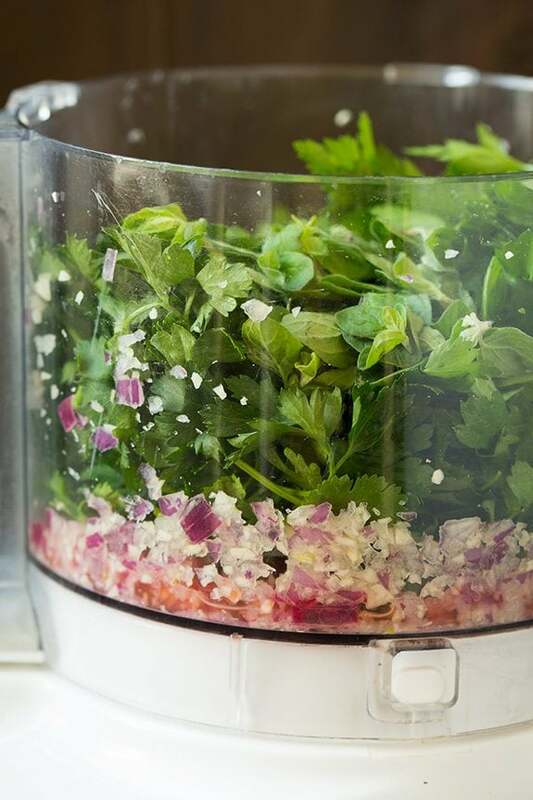 For the chimichurri sauce: Add red onion, garlic, red wine vinegar, lemon juice and salt to a food processor. Pulse, stopping and scraping down sides occasionally, until finely minced. Add in parsley, cilantro, oregano and red pepper flakes, then pour in olive oil while pulsing several times until herb leaves are finely minced**. Transfer to a bowl, cover and chill until ready to serve. For the chicken: Preheat a grill to 425 degrees over medium-high heat. In small mixing bowl whisk together cumin, coriander, salt and pepper. Pound chicken to an even thickness using the flat side of a meat mallet then brush both sides lightly with olive oil. Sprinkle and rub both sides evenly with cumin mixture. Transfer to clean grill grates and grill until center of chicken registers 165 on an instant read thermometer, about 4 minutes per side. *Use leaves and some stem with all the herbs. **Don't puree/pulverize everything, it should still have some texture. 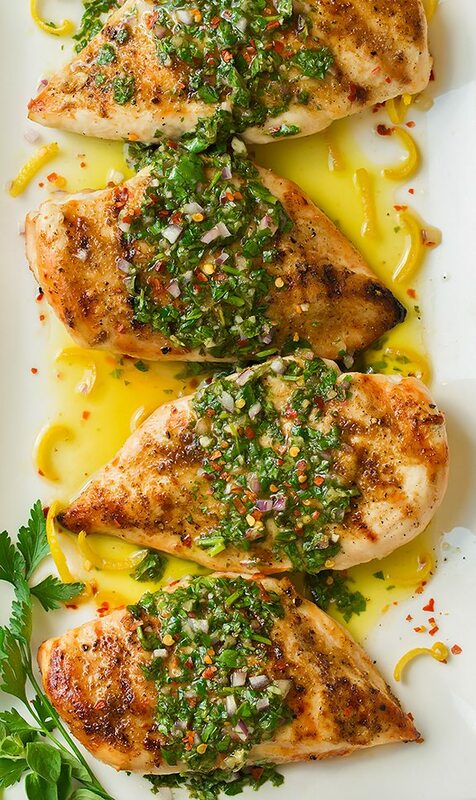 You'll likely have left over chimichurri sauce, probably about enough to make one more batch of chicken another time and the sauce can be frozen.